Here’s an article – Dos orejas, rabo… y una de callos – that I first came across about a year ago in Metropoli. 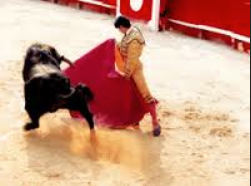 Given that then, like now, it was around the time of the San Isidro Festival, they thought that they would write an article on the best taurine-related (bullfight) bars and restaurants in Madrid. On this list you will find two of Madrid’s oldest eating (and drinking!) establishments – Casa Alberto and La Taberna de Antonion Sánchez – dating from 1827 and 1830, respectively. There is also one fantastic place – El Rincón de Jerez – which offers good Andalucian food and where, every night at 11 pm., they dim the lights and sing to the Virgin Maria. One place called, New Street (Spanish in all but name! ), even serves up the a dish of bull’s tail from one of the bulls which fought the day before. Use the Google Translation Tool for a rough translation. Stop this barbarity: The European Union should be ashamed to allow such savagery in Europe. Barbarity? Banning the bars or the bullfights?